What was your motivation in spending five years travelling around Myanmar and interviewing people about its literary heritage and the state of the art? I’m a big fan of short fiction. When I moved to Myanmar in 2011 it was difficult to find local literary works available in English translation, other than Nu Nu Yi Inwa’s Smile as they Bow and a few books from the 1960s. Once I was in Yangon, a few more locally published translated collections surfaced, notably the excellent Selected Myanmar Short Stories, published by Seikku Cho Cho, and The Sixth Enemy and Other Stories by Ma Sandar (on the other hand non-fiction in translation is much more widely available). A post-censorship time made it easier to be in contact with Burmese writers and poets, and I came across a good friend of mine reading a Shan-language book. In Yangon, I would ask writers and publishers if there were any works available in the ethnic languages and they would often say that no such writers or writing existed. This is no fault of those in Yangon; censorship, travel restrictions and no Internet or mobile phones made it extremely difficult to know what was happening in other parts of the country. But, I couldn’t forget that Shan book with the tiger leaping off the cover. If this existed, surely others must? Are there any other context points that you’d like to make in undertaking this Hidden Words, Hidden Worlds project in Myanmar? The anthology is one of many interlaced components that make up the Hidden Words, Hidden Worlds programme. Since 2012, the programme has attempted to engage with ‘talents’ across the literature community, in short story and translation workshops, public speaking, editing and proof-reading, publishing in the Myanmar edition of the anthology, and so on. Together they all form part of a broader notion of giving a voice in some meaningful way to all those involved in literature in Myanmar. As I look back on the last five years, one thing that does surprise me is how at no point did the programme unravel. Everything the British Council was doing was in some way unprecedented. There was no blueprint to refer to. If the programme were to be run now, it would certainly benefit from the increased mobile coverage and internet connectivity, conditions that didn’t really exist when we started. At one point, I was communicating with writers in Kachin state to the north via handwritten messages passed along by students returning home on the train to Myitkyina. What themes have the authors and poets been grappling with as the country attempts a transition to a more open society? It would be fair to claim there are two literary realms in Myanmar. The Burmese-language writers in Yangon and Mandalay (though formal writers’ groups exist in many other towns across the country), and the ethnic language writers. For Burmese language writers, the abolition of pre-publication censorship in August 2012 and the dismantling of the Press Scrutiny and Registration Division in January 2013 certainly allowed more freedom in terms of what could be written. But I am sure many writers are unsure of how far they can push these new freedoms and will select their words with caution. Self-censorship is just as unremitting as state censorship. I guess there is also a concern about what will happen should the transition prove unsuccessful. Would a future censorship board look back and start taking account of those who were critical? For ethnic writers, the challenges are far more prosaic. Not being allowed to read and write in their own languages has caused a generational deficit in reading and writing skills. During the editing process of the multi-lingual Myanmar edition of the anthology, which featured twelve languages and eleven scripts, it was difficult to find proofreaders who could not only read the text in their language but also correct any errors using a computer. Many of these ethnic languages have yet to be standardised. Unfortunately, very little fiction is produced, but consistent themes can be found around poverty, conflict, drug abuse, community ties and cultural rites of passage. Ethnic language literature also suffers from logistical barriers in terms of access to bookshops and printing facilities. The eBook revolution, at least the ePub format, has yet to make a mark in Myanmar in either realm. What role do you think a multi-ethnic anthology like this one can play in nation building or national reconciliation? What’s your hope? One quirk of fiction is how a personal connection can be made between the writer and us readers in which we feel the narrative speaks to elements of our own lives; and yet the same story can also touch a wider, collective audience. This is especially true of fiction that explores seemingly unrelated worlds from multiple perspectives and in different languages within a single nation, such as Myanmar. What begins as an enclosed sense of shared identity among those who only belong to that world is affected by the universal similarities between communities and peoples – those values, attitudes, experiences and beliefs that are common to us all. I hope that exposure to these affinities, through anthologies such as this, can contribute in a small way towards shaping a culture of understanding and respect. 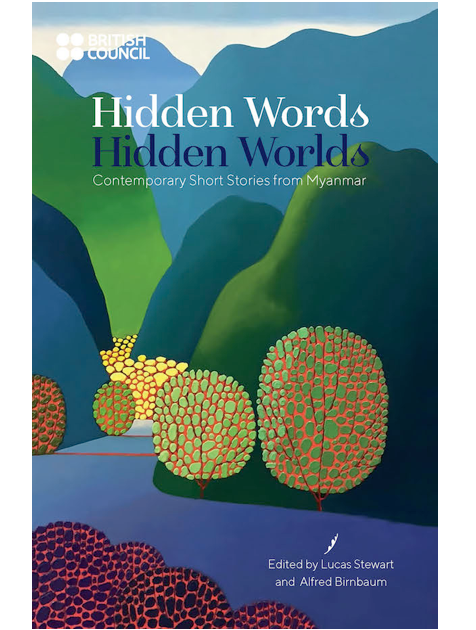 Hidden Words, Hidden Worlds is published by the British Council (2017). To read everything else in Issue 34, visit our eShop to take out a subscription or buy a print or digital copy.